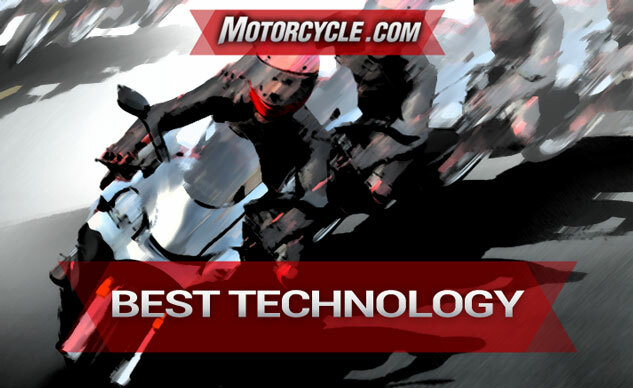 When cornering ABS (C-ABS) arrived a couple years ago, the general consensus among the motojournos was, Hey that’s awesome, we’ll take your word for it working as described, because no matter how professional we try to be, grabbing a fistful of front brake mid-corner to evaluate this new technology is a line few were willing to cross. At the International Driver & Rider Training Symposium, EiC Kevin Duke and I were given a chance to fully explore C-ABS thanks to this year’s Best Product winner, Skidbike. 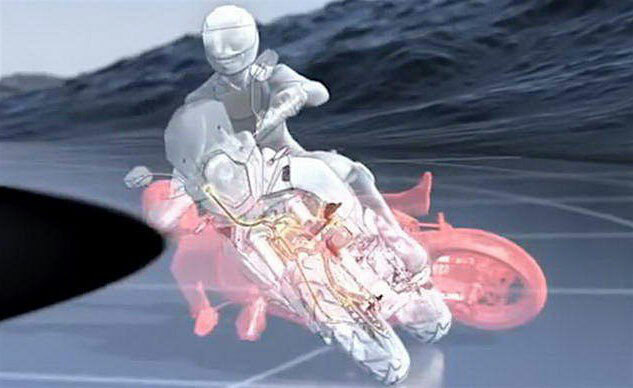 Having sampled the capabilities of Skidbike’s crash prevention on a Honda CRF250L, we were anticipating an enlightening experience when switching to KTM’s 1190 Adventure model, and we weren’t disappointed. Brimming with the confidence only a motorcyclist who’s incapable of crashing has, we eagerly leaned the big ADV bike into an arcing corner, and without hesitation grabbed the front brake lever. The result? Rapid and drama-free deceleration. Switching off C-ABS and replicating the act resulted as you’d expect, with the front wheel washing away, but minus the crash due to Skidbike’s outriggers catching our falls. We experimented with stabbing the front brakes, as well as applying continually more brake pressure in a series of front braking threshold tests, and C-ABS kept the front wheel from locking, allowing for controllable deceleration when a motorcycle might otherwise tend to stand up and go straight instead of maintaining lean angle and continuing its cornering arc. We were riding in a controlled area, but the advantages are obvious for any street rider who might, for example, get too hot into a decreasing-radius turn, or encounter an object mid-corner that demands avoidance.Knowing that you can, if required, apply a substantial amount of braking force while cornering, without fear of crashing, is a huge mental benefit. 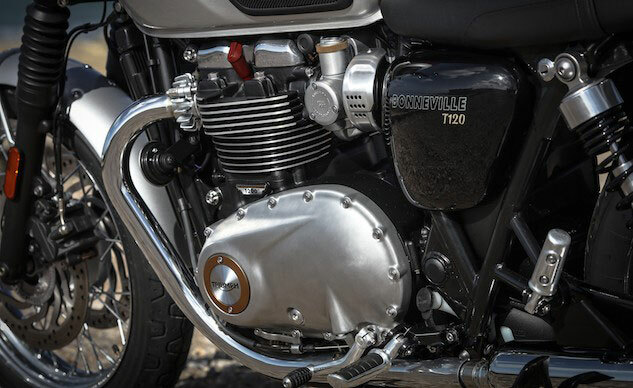 Our 2016 Honorable Mention for the best use of Technology goes to the engineers and designers at Triumph who managed to make a fuel-injected, liquid-cooled engine appear to be carbureted and air-cooled. The inspiration of the new Bonneville is directly traced to models of yore, but to come up with a package so striking, adhering to the simplicity of the past while embracing modern mandatory restrictions, is no small feat. Note the complete lack of external cooling plumbing. For an example of how ugly a cobweb of black rubber tubes can be, look no further than the left side of any current model Ducati Monster. Renown for beautiful Italian styling, if it were easy or cost efficient to hide that hideous muck, don’t you think Ducati would have? So, kudos to Triumph for going the extra mile to tidy-up the newest Bonneville, Thruxton and Street Twin, and really a make a modern engine almost as beautiful as its air-cooled predecessors. In fact, Triumph’s new l-c motors look more attractive than the previous Hinckley air-cooled editions. Note how out-of-sight the coolant reservoir is located, and that in this photo there is an unseen evap canister. The new EFI throttle bodies are so cleverly disguised as carburetors you’d think Triumph contracted Amal to construct them. About the only thing Triumph engineers couldn’t figure out how/where to hide is the radiator. But with an ever-increasing demand for more horsepower, liquid-cooling can only be avoided for so long, and a radiator is the result. Maybe the next all-new Bonnie will feature frame downtubes constructed from nanotubes with the radiator inside. At this point, it’s the only thing left to go.